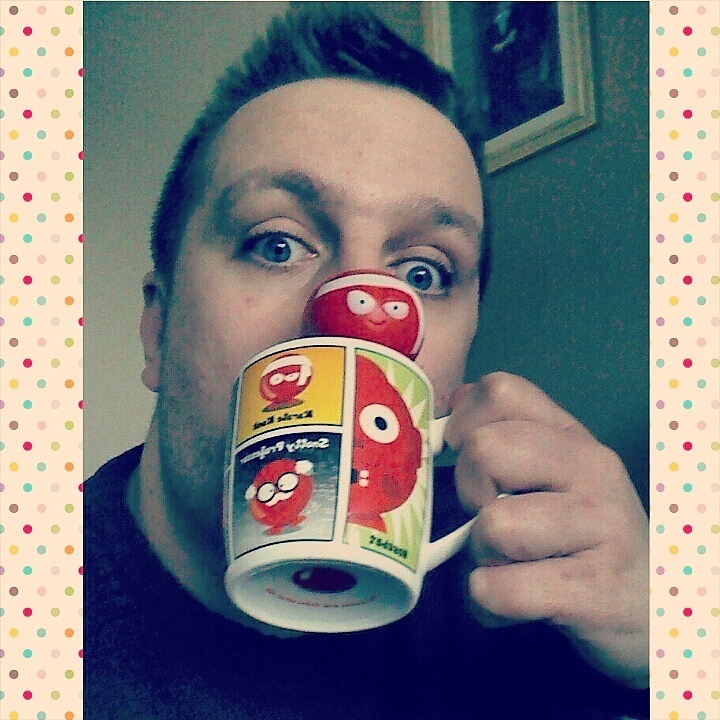 Red Nose Day is back! The biennial Red Nose Day for Comic Relief, one of my favourite charity telethons is back again for its 30th year this year, on Friday 13th March. It’s long been a cause I’ve supported and donated to – and also in its Sport Relief guise on odd numbered years, as it has always, at its heart, approached fundraising for amazing causes in the UK and abroad in a light hearted way via a night of top comedians and entertainment on BBC One. My childhood memories of Red Nose Days were always of non uniform days at school where you donated a pound to wear red for a day, and of teachers being sponsored to sit in a bath of baked beans (still quite a British thing to do I say. You wouldn’t get that in America, and I thus love it), followed by the 6 hour telethon on that same Friday night. 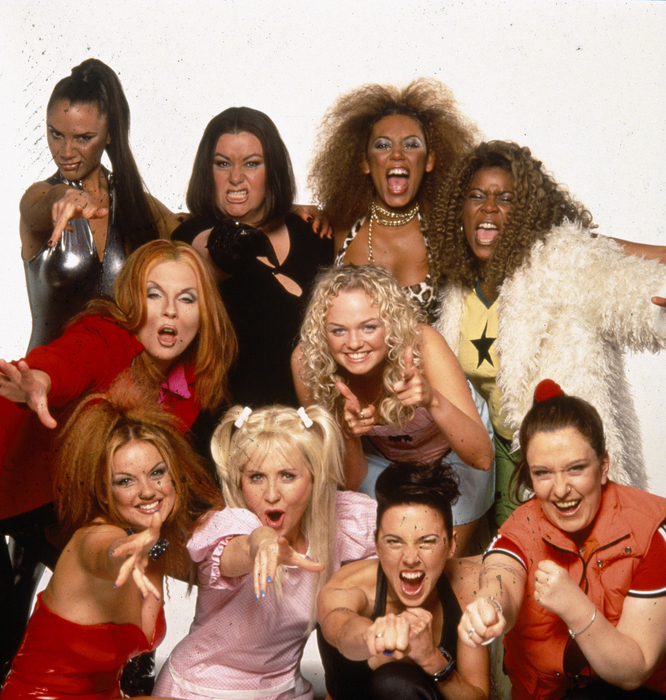 In early 1997, the Spice Girls were on top of the world – bringing a new generation of pop fans some serious girl power. Only right then, that their then forthcoming single ‘Who Do You Think You Are?’, was chosen as that year’s official single for Comic Relief. A multitude of copycat girl groups were springing up in the Spices’ wake, but only one was to meet with their approval – step forward the Sugar Lumps. And like their counterparts, they each had a nickname and persona too – Ginger Lumps (Jennifer Saunders), Posh Lumps (Dawn French), Scary Lumps (Llewella Gideon), Sporty Lumps (Kathy Burke) and Baby Lumps (Lulu). It set up the trend for the hottest pop acts of the moment to record the official single whilst taking the mickey with top comedians, and ‘Who Do You Think You Are?’ rocketed the girls straight to #1 in the UK charts again, raising over a quarter of £1m for the charity. 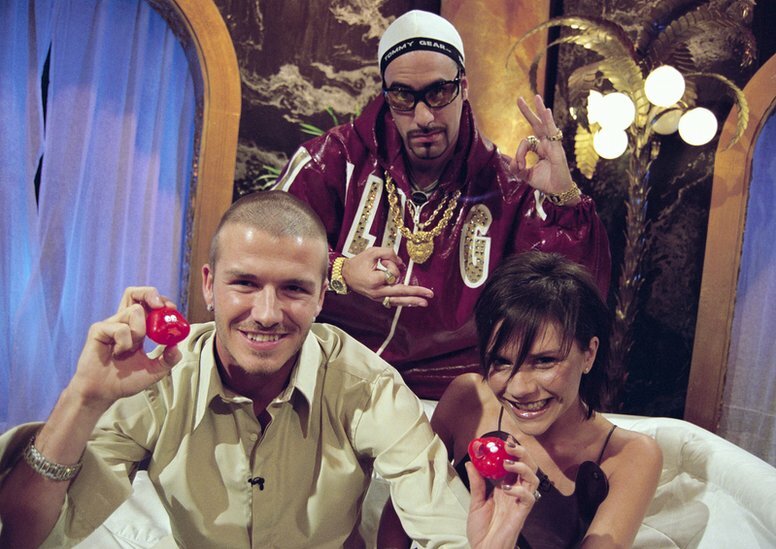 Just five years later in 2001, Posh Spice herself, Victoria Beckham was back on the telethon, this time with footballer hubby David as they took part in a sketch with Staines’ most gangsta rapper Ali G (aka Sacha Baron Cohen) where he interviewed them. Ali G: “And what about Brooklyn? It also nonetheless proved that Victoria and David had a deliciously dry sense of humour – hence why, they’re probably still held in great affection by us Brits and the world over. The appeal films shown throughout the night on the telethon, moving as they are, nonetheless show what a real difference the money raised for Comic Relief can make – even the smallest amount. When the McFly lads were chosen to record the official single ‘All About You’ in 2005, they also went out to Uganda to see first hand one of the communities that was benefitting from Comic Relief fundraising, in Kamowokya. The appeal film then became a video for the B-side of their single, a cover of the Carole King standard ‘You’ve Got a Friend’ – a truly moving video if you find it on YouTube. When they returned two years later in 2007 for a special BBC report, they saw that much had changed – for the better – and as a result of the money raised from the release of their chart topper, a new school had been opened, providing an education for the children of Kamowokya, something we all take for granted so readily in this country. It really highlights the message of what Comic Relief achieves through any amount given, big or small. In recent years with the telethon, fundraising efforts have also extended to events before the actual night – and some of them the most extreme imaginable. In 2009, the Captain of Take That, Gary Barlow, assembled a group of famous friends – Cheryl and Kimberley from Girls Aloud, Alesha Dixon, Fearne Cotton, Chris Moyles, Ben Shepherd, Denise van Outen and Ronan Keating – to trek up the epic Mount Kilimanjaro in Tanzania. Their ardurous climb, battling against extreme temperatures and altitude sickness made gripping viewing, and the team ended up raising a cool £2m for that year’s appeal. Two years later in 2011, another team of famous faces – among them, Olly Murs, Dermot O’Leary, Kara Tointon and Lorraine Kelly – trekked through the Kaisut desert in Kenya, raising nearly double on 2009’s trek. Bizarrely, in the five years her sitcom was on air, Miranda Hart only made one appearance of note on a Red Nose Day telethon, in 2011. But boy was it what we call such fun. Part a parody of cult Sky1 favourite ‘Pineapple Dance Studios’ with Louie Spence, the sketch saw her, Gary, Stevie and Penny run the famous dance studios in London’s Covent Garden, whilst ‘bear with’ frenemy Tilly became the new manager of visitors and X Factor boyband JLS. So where do Miranda and chums come into this then? Cue a mixup with the day for auditioning dancers for the JLS lads’ performance of ‘Eyes Wide Shut’ on the telethon night and you can probably guess the hilarious outcome. It was also on the 2011 telethon that probably one of the most talked about sketches in history featured, as the charity poked fun at itself for a change. It imagined an alternate reality, where founders Richard Curtis and Lenny Henry were depicted as being ‘on the brink’ of not being able to pull in any big name stars for that year’s event. Cue James Corden, in his Smithy guise from ‘Gavin & Stacey’, and a whole host of hilarious cameos from Davina McCall to Gordon Brown via Sir Paul McCartney and Rio Ferdinand (and not forgetting George Michael) for a boardroom meeting few will ever forget.